Precious little information leaked out today about her trip, but we do have this from P.J. Crowley at the press briefing today. MR. CROWLEY: Good afternoon and welcome to the Department of State. The Secretary, as you may know, has arrived in Astana, Kazakhstan and I think, as of this morning, had her town hall event with civil society representatives and also had a meet and greet with women leaders in Kazakhstan prior to starting the formal proceedings of the OSCE. SECRETARY CLINTON: Well, good afternoon. Do we have enough room in here? I want to take a moment to discuss the recent news reports of classified documents that were illegally provided from United States Government computers. In my conversations with counterparts from around the world over the past few days, and in my meeting earlier today with Foreign Minister Davutoglu of Turkey, I have had very productive discussions on this issue. The United States strongly condemns the illegal disclosure of classified information. It puts people’s lives in danger, threatens our national security, and undermines our efforts to work with other countries to solve shared problems. This Administration is advancing a robust foreign policy that is focused on advancing America’s national interests and leading the world in solving the most complex challenges of our time, from fixing the global economy, to thwarting international terrorism, to stopping the spread of catastrophic weapons, to advancing human rights and universal values. In every country and in every region of the world, we are working with partners to pursue these aims. So let’s be clear: this disclosure is not just an attack on America’s foreign policy interests. It is an attack on the international community – the alliances and partnerships, the conversations and negotiations, that safeguard global security and advance economic prosperity. I am confident that the partnerships that the Obama Administration has worked so hard to build will withstand this challenge. The President and I have made these partnerships a priority – and we are proud of the progress that they have helped achieve – and they will remain at the center of our efforts. I will not comment on or confirm what are alleged to be stolen State Department cables. But I can say that the United States deeply regrets the disclosure of any information that was intended to be confidential, including private discussions between counterparts or our diplomats’ personal assessments and observations. I want to make clear that our official foreign policy is not set through these messages, but here in Washington. Our policy is a matter of public record, as reflected in our statements and our actions around the world. I would also add that to the American people and to our friends and partners, I want you to know that we are taking aggressive steps to hold responsible those who stole this information. I have directed that specific actions be taken at the State Department, in addition to new security safeguards at the Department of Defense and elsewhere to protect State Department information so that this kind of breach cannot and does not ever happen again. Relations between governments aren’t the only concern created by the publication of this material. U.S. diplomats meet with local human rights workers, journalists, religious leaders, and others outside of governments who offer their own candid insights. These conversations also depend on trust and confidence. For example, if an anti-corruption activist shares information about official misconduct, or a social worker passes along documentation of sexual violence, revealing that person’s identity could have serious repercussions: imprisonment, torture, even death. So whatever are the motives in disseminating these documents, it is clear that releasing them poses real risks to real people, and often to the very people who have dedicated their own lives to protecting others. Now, I am aware that some may mistakenly applaud those responsible, so I want to set the record straight: There is nothing laudable about endangering innocent people, and there is nothing brave about sabotaging the peaceful relations between nations on which our common security depends. There have been examples in history in which official conduct has been made public in the name of exposing wrongdoings or misdeeds. This is not one of those cases. In contrast, what is being put on display in this cache of documents is the fact that American diplomats are doing the work we expect them to do. They are helping identify and prevent conflicts before they start. They are working hard every day to solve serious practical problems – to secure dangerous materials, to fight international crime, to assist human rights defenders, to restore our alliances, to ensure global economic stability. This is the role that America plays in the world. This is the role our diplomats play in serving America. And it should make every one of us proud. The work of our diplomats doesn’t just benefit Americans, but also billions of others around the globe. In addition to endangering particular individuals, disclosures like these tear at the fabric of the proper function of responsible government. People of good faith understand the need for sensitive diplomatic communications, both to protect the national interest and the global common interest. Every country, including the United States, must be able to have candid conversations about the people and nations with whom they deal. And every country, including the United States, must be able to have honest, private dialogue with other countries about issues of common concern. I know that diplomats around the world share this view – but this is not unique to diplomacy. In almost every profession – whether it’s law or journalism, finance or medicine or academia or running a small business – people rely on confidential communications to do their jobs. We count on the space of trust that confidentiality provides. When someone breaches that trust, we are all worse off for it. And so despite some of the rhetoric we’ve heard these past few days, confidential communications do not run counter to the public interest. They are fundamental to our ability to serve the public interest. In America, we welcome genuine debates about pressing questions of public policy. We have elections about them. That is one of the greatest strengths of our democracy. It is part of who we are and it is a priority for this Administration. But stealing confidential documents and then releasing them without regard for the consequences does not serve the public good, and it is not the way to engage in a healthy debate. In the past few days, I have spoken with many of my counterparts around the world, and we have all agreed that we will continue to focus on the issues and tasks at hand. In that spirit, President Obama and I remain committed to productive cooperation with our partners as we seek to build a better, more prosperous world for all. Thank you, and I’d be glad to take a few questions. MR. CROWLEY: We’ll begin with Charlie Wolfson of CBS in his last week here covering the State Department. SECRETARY CLINTON: Where are you going, Charlie? QUESTION: I’ll (inaudible) into the sunset, but let me get to a question. QUESTION: Madam Secretary, are you embarrassed by these leaks personally, professionally? And what harm have the leaks done to the U.S. so far that you can determine from talking to your colleagues? SECRETARY CLINTON: Well, Charlie, as I said in my statement, and based on the many conversations that I’ve had with my counterparts, I am confident that the partnerships and relationships that we have built in this Administration will withstand this challenge. The President and I have made these partnerships a priority, a real centerpiece of our foreign policy, and we’re proud of the progress that we have made over the last 22 months. Every single day, U.S. Government representatives from the entire government, not just from the State Department, engage with hundreds if not thousands of government representatives and members of civil society from around the world. They carry out the goals and the interests and the values of the United States. And it is imperative that we have candid reporting from those who are in the field working with their counterparts in order to inform our decision-making back here in Washington. I can tell you that in my conversations, at least one of my counterparts said to me, “Well, don’t worry about it. You should see what we say about you.” (Laughter.) So I think that this is well understood in the diplomatic community as part of the give-and-take. And I would hope that we will be able to move beyond this and back to the business of working together on behalf of our common goals. MR. CROWLEY: Kim Ghattas of BBC. QUESTION: Madam Secretary, I was wondering whether you could tell us what you think your upcoming trip is going to look like. Presumably, a lot of the people who have been mentioned in those alleged cables are going to have conversations with you. Do you think it’s going to cause you discomfort over the coming week as you engage in conversations with those leaders? And I know you don’t want to comment on the particulars of the cables, but one issue that has been brought up into the daylight is the debate about Iran. What do you think the impact is going to be of those documents on the debate about Iran in the coming weeks and months? SECRETARY CLINTON: Well, Kim, you’re right. And I don’t know if you’re going on this trip or not, but we will be seeing dozens of my counterparts in Astana, and then as I go on from Kazakhstan to Kyrgyzstan and Uzbekistan and then ending up in Bahrain for the Manama dialogue. And I will continue the conversations that I have started with some in person and over the phone over the last days, and I will seek out others because I want personally to impress upon them the importance that I place on the kind of open, productive discussions that we have had to date and my intention to continue working closely with them. Obviously, this is a matter of great concern, because we don’t want anyone in any of the countries that could be affected by these alleged leaks here to have any doubts about our intentions and our about commitments. That’s why I stressed in my remarks that policy is made in Washington. The President and I have been very clear about our goals and objectives in dealing with the full range of global challenges that we face. And we will continue to be so and we will continue to look for every opportunity to work with our friends and partners and allies around the world and to deal in a very clear-eyed way with those with whom we have differences, which of course brings me to Iran. I think that it should not be a surprise to anyone that Iran is a source of great concern not only in the United States, that what comes through in every meeting that I have anywhere in the world is a concern about Iranian actions and intentions. So if anything, any of the comments that are being reported on allegedly from the cables confirm the fact that Iran poses a very serious threat in the eyes of many of her neighbors, and a serious concern far beyond her region. That is why the international community came together to pass the strongest possible sanctions against Iran. It did not happen because the United States went out and said, “Please do this for us.” It happened because countries, once they evaluated the evidence concerning Iran’s actions and intentions, reached the same conclusion that the United States reached – that we must do whatever we can to muster the international community to take action to prevent Iran from becoming a nuclear weapons state. So if anyone reading the stories about these alleged cables thinks carefully, what they will conclude is that the concern about Iran is well founded, widely shared, and will continue to be at the source of the policy that we pursue with likeminded nations to try to prevent Iran from acquiring nuclear weapons. MR. CROWLEY: We’ve got to let the Secretary get to her airplane and get to her trip. Thank you very much. SECRETARY CLINTON: I will leave you in P.J.’s very good hands. Thank you. 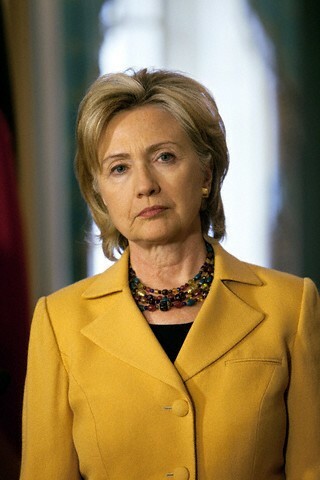 QUESTION: Madam Secretary, did you talk to anyone in Pakistan or India? SECRETARY CLINTON: Thank you all. QUESTION: Thank you, Madam. (Inaudible). Note to readers: I apologize that the videos here were not working for part of the day. Word Press changed the coding convention. They are working now. SECRETARY CLINTON: Well, I am delighted once again to welcome both a colleague and a friend here to the State Department. The foreign minister and I have worked closely together during the last, now, 22 months. And I am very pleased that he can be here once again for us to discuss a range of issues. Turkey and the United States have one of the most important bilateral relationships in the world. We are very committed to continuing to strengthen and deepen that relationship. And it is always very constructive for me to meet with the foreign minister because we have so much that needs to be done that only Turkey and the United States can do together. FOREIGN MINISTER DAVUTOGLU: Thank you very much. Again, it’s a great pleasure and honor for me to be in the State Department and having a chance to discuss a variety of agenda items with my colleague and friend, Secretary Clinton. Turkish-American relations is a relation of (inaudible) partnership and strategic partnership; therefore there’s a huge variety of agenda items today we will be sharing, including the leak documents. And I want – I would like to express our thanks because of the briefing in advance. Our Turkish (inaudible) foreign policy, the principled (inaudible), time-tested transparent foreign policy, including our relations with the U.S. And we will follow the same principled foreign policy to achieve regional and global peace in coordination with the American Administration. SECRETARY CLINTON: Thank you all very much. 10:30 a.m. Secretary Clinton holds a bilateral meeting with Turkish Foreign Minister Ahmet Davutoglu, at the Department of State. 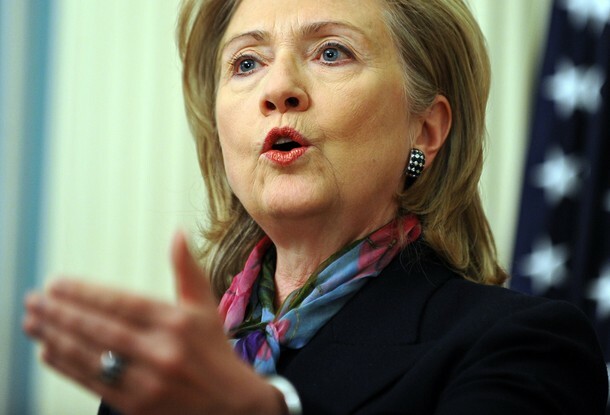 1:00 p.m. Secretary Clinton delivers a statement to the press, at the Department of State. 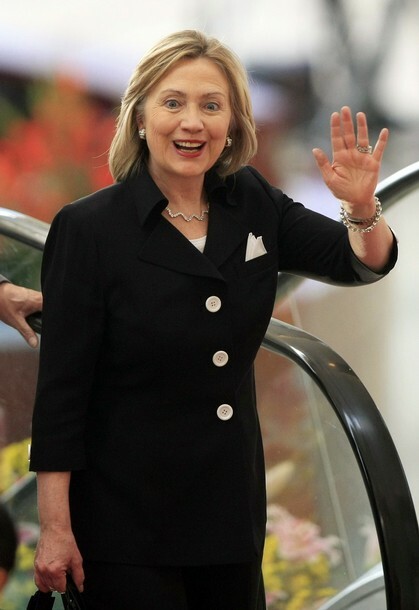 PM Secretary Clinton departs for foreign travel. WOO-HOO! After one of the the gloomiest Thanksgiving weekends nationally that I can remember since 1963 after JFK was assassinated and 2001 after 9/11, a bright sun rises with this list of The FP Top 100 Global Thinkers. I love it! The two of them together. The power couple, together is the limelight. Just perfect! for proving that you don’t need to be president to act presidential. Ironically, two of the people most crucial to the new global century are the Clintons themselves: the ex-president and the ex-would-be-president, the power couple now defined by their position just outside the highest reaches of power. Except that, these days, both Clintons are more influential, and more beloved, than ever. Bill’s Clinton Global Initiative is starting to feel like a sexier, more effective competitor not just to Davos but to the United Nations itself, bringing world leaders together to commit their resources to fighting poverty with market-based, technocratic solutions. As of this summer, his foundation had contributed $23 million and countless man-hours to the effort to rebuild Haiti. Polls have shown he’s a better advocate for Democratic candidates than the actual president, and he spent most of the fall stumping for woebegone Dems from Orlando to Seattle. Meanwhile, Hillary showed up in one recent poll as the most popular political figure in the United States, an accolade she has earned through a no-drama approach to an array of thankless tasks: brushing off Vladimir Putin’s temper tantrum to reach agreement on nuclear disarmament and Iran sanctions, promoting women’s rights over the objections of entrenched traditionalists, and launching an innovative effort to bring clean cookstoves to the world’s poorest. But what she has mainly stood for is American competence, with her Quadrennial Diplomacy and Development Review a major, if unglamorous step toward making U.S. statesmanship a more agile beast. If this is what Clinton nostalgia looks like, bring it on. As already mentioned in an earlier post, Secretary Clinton spent a good deal of her weekend on the phone, first with Asian allies over the situation between North and South Korea, and later with allies all over the world in connection with with anticipated, now actual, Wikileaks release of embassy cables. Among the reports, and I can no longer locate the story, was a proposed meeting of the Secretary of State and the Japanese, South Korean, and Chinese Foreign Ministers in DC this week. If that meeting is on I see no news of it, and, according to the press release below, it would have to occur on Monday since Mme. Secretary will be traveling again on Tuesday. She is, however, scheduled for a bilateral with Turkish Foreign Minister Davutoglu. That, we have to guess, will probably be scheduled for Monday for the same reason. ANKARA — Turkish Foreign Minister Ahmet Davutoglu starts a four-day visit to the United States Saturday for talks on bilateral ties and regional issues, the foreign ministry said Friday. Davutoglu was to meet with Secretary of State Hillary Clinton, national security advisor Tom Donilon and the head of the Senate foreign relations committee, Senator John Kerry, the statement said. A press release this evening reports the following travel plans. Secretary of State Hillary Clinton will travel to Kazakhstan, the Kyrgyz Republic, Uzbekistan, and Bahrain November 30 – December 3. In Kazakhstan, she will attend the Summit of the Organization for Security and Cooperation in Europe (OSCE) as head of the U.S. delegation. Prior to the Summit, she will host an event for local and international non-governmental organizations, underscoring the importance of a vibrant civil society. She will also meet with Kazakhstan’s President Nazarbayev and Foreign Minister Saudabayev to discuss various aspects of the U.S.-Kazakhstan strategic partnership. In the Kyrgyz Republic, Secretary Clinton will meet with President Otunbayeva and other government officials. She will review political developments in the wake of Kyrgyzstan’s historic election, and discuss a range of issues of mutual concern. In Uzbekistan, Secretary Clinton will meet with President Karimov to discuss a wide range of matters in our bilateral relationship and in regional affairs. In Bahrain, Secretary Clinton will deliver the keynote address on the role of the United States in regional security at The Manama Dialogue 2010, an annual forum hosted by the International Institute for Strategic Studies in cooperation with the Kingdom of Bahrain. With her other hand, Mme. Secretary will be juggling the Wikileaks fallout, which, from what I have seen so far, is surprisingly bland. Angela Merkel not creative? To my knowledge, she has not claimed to be Martha Stewart. Putin an alpha dog? Yes, he has probably said that himself. Of course there is more. Much much more. The SOS will deal with it as she wings her way through this next tour. God Bless you, Mme. Secretary. Godspeed. Have a safe trip! Well here we are at H-Hour-minus-0ne, and I do not know if Wikileaks is still under attack, but I hope they are. Wikileaks and Al Qaeda are, to my mind, simply different aspects of terrorism. Both have charismatic, clever cult leaders, neither has a specific geographical location as a base of operation*, both attack multiple nations, yet neither is a nation or truly affiliated with one. On CNN this morning, Mike Mullen explained why and how Wikileaks endangers individuals and groups, military and otherwise. Essentially, he said that one small item, one little factoid, as Hillary Clinton might call it, could be the missing link that connects two sets of dots and points to people or groups who are serving undercover. Given the heft of this upcoming doc-dump (purportedly seven times the size of the previous one) there is no way that Wikileaks or any government could possibly know exactly what is dangerous within the documents or to whom. If that alone is not a definition of irresponsibility and recklessness, I do not know what is. Yet Wikileaks and Julian Assange persist and in much the same way that Al Qaeda and Bin Laden paint themselves as holy warriors, entitle themselves whistleblowers, a term with a generally positive connotation. Whistleblowers call attention to violations of law and principles. They serve people who are endangered or violated in some way. Ushahidi , of which Secretary Clinton has spoken, can be used by whistleblowers wanting to report corruption, crime, election fraud, a huge range of possible criminal and unethical behaviors. While it is possible and even probable that some of what Wikileaks has released in the past fits the description above, a good deal goes beyond whistle blowing. In this country, we have a tradition of respecting military intel. The very first violation of that respect actually provided the name we use for traitors. When we read the history of that transaction and its consequences we learn that Major Andre’s executors shed tears for him, but Benedict Arnold survived as does his name in eternal American disgrace. There is nothing honorable or altruistic in turning over the virtual maps of the West Points of today. I will not speculate as to what this dump contains because it promises to rival The Bible in volume. If some of the material proves embarrassing to our Secretary of State and her Department, I am sure there is enough international embarrassment to go around and neutralize the remarks to some extent. But if, as Admiral Mullen states, lives are endangered, I think our government, led by the Commander in Chief, should call Wikileaks what it is, a terrorist organization holding nations hostage with purloined communications and documents. They are nothing short of that. Finally, in light of Mme. Secretary’s focus on internet freedom: Like all freedoms, freedom of communication carries with it responsibilities. I have the freedom to own a gun provided I fulfill the legal requirements in doing so. That does not imply that I may use that gun to murder. So it is now H-Hour+seventeen minutes and counting. I hope to God they are still hacked, and I hope our government, perhaps in conjunction with international partners has done it. *Hosting for Wikileaks is by a Sweden-based company. That is as close to a “base” as one gets. They say they have servers all over the globe in undisclosed locations. This is not dissimilar to Al Qaeda operating along the Af-Pak border with Secretary Clinton expressing certainty that someone somewhere in the Pakistani government knows the whereabouts of Bin Laden.